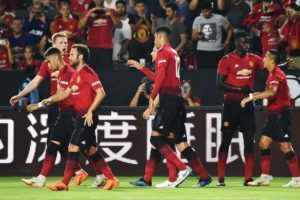 Manchester United and AC Milan faced off in the International Champions Cup game in the United States leg of the pre-season tournament. Both teams are hoping to use this tournament to build fitness ahead of what promises to be a gruelling campaign ahead. After playing two dour games earlier, United looked better, passed better and generally played better. Sanchez had given us the lead in the 12th minute following a brilliant pass by Juan Mata while an error from the United backline allowed Suso to ghost in behind and shoot past Lee Grant in goal, with us ultimately winning on pens. Alexis Sanchez struggled when he signed from Arsenal in the January transfer window. The 29-year-old was exceptional on the night, exchanging passes with the midfielders and overly looking sharp. He played as a striker and tormented the Milan backline time and time again. He looked energized from the blast of the whistle, which goes to show that his vacation this summer has helped him. He will get better next season and offers Jose Mourinho another option in the striking department. At some point in the game, cameras showed Jose Mourinho shaking his head in a rueful manner. The central defensive partnership of Eric Bailly and Phil Jones were abysmal and showed another evidence as to why Jose Mourinho needs another centreback. They lacked cohesion, struggled to keep up, and were at fault for the opening game. Time and time again Milan caught them off guard with the ball over the top. With this display, United need to go all out for Harry Maguire or Toby Alderweireld. 22-year-old Brazilian midfielder has stated his desire to remain at Old Trafford for the upcoming season. He was on loan at Valencia and played in a deep-lying playmaker position. He played well between the channels and struck a fantastic on-pitch relationship with Sanchez. His passes were incisive and showed flashes of his brilliance. Brazilian midfielder, Fred was signed by Jose Mourinho to add mobility and overall midfield play. The likes of Nemanja Matic and Paul Pogba are shoed-in to okay in the middle, meaning that there is space for one more player. Ander Herrera enjoyed a fantastic campaign in the 16/17 season, but struggled last term. In the game against Milan, he didn’t cover himself in glory and should be worried about his chances come next term. For all of Jose Mourinho’s defensive coaching prowess, it seems United defenders don’t know the techniques of whipping in crosses. The defenders such as Luke Shaw and Matteo Darmian kept crossing without looking up and checking to see if their teammates were in good positions. The attributes of a good defender is knowing when to cross the ball and knowing when to play it short.